Cycling has become one of our little weekend family activities recently. It’s lovely. Little Noah has been able to ride his bike for some time now, but he’s been cycling on his smaller BMX bike that was more comfortable for him. Isla has only just started riding her bike. So as Isla was a little unsure on her feet, we thought it was maybe time to encourage Noah to go out on his larger mountain bike. We drove up to Grafham and cycled some of the route around Grafham water. The entire circuit is around 9 miles, we didn’t do it all, but I suspect we will do soon. Noah loved his mountain bike, he kept changing all the gears to test what they did and his brakes worked very well. He looked so grown up. The problem was that because Daddy and I walked alongside them, he just wanted to zoom off and we couldn’t let him. Little Isla loves her pretty bike (so do I), she loves taking her soft toys out on our bike rides. Most often it is her beloved monkey that gets the ticket. She sings along on her bike and talks to her monkey too, it is really cute watching her. She just cycles along soaking up the environment and taking it all in. On Isla’s first bike ride she cycled 6.5 miles, which was brilliant. We all went out together on bikes, on that particular occasion. This time the kiddies cycled 7.7 miles which is absolutely fantastic. It was such hard work up the hills too. Isla kept having to walk her bike and monkey up the hill, but she soon got to used to it. It was good practice stopping and starting the bike in any case. 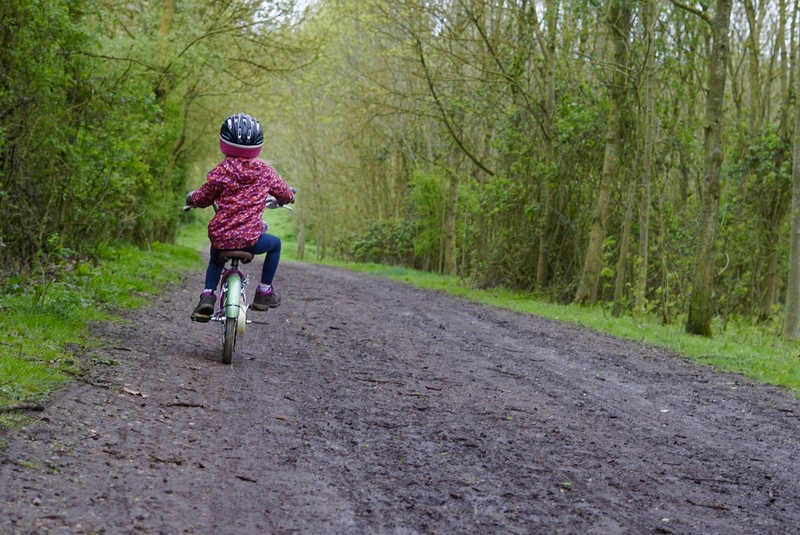 Do you have a favourite route to cycle on with your family? We are finding more good routes all the time. I am hoping we can go back to one our favourite scooting route soon and cycle it – hopefully we can go a bit further too. Such pretty photos as always. WELL DONE Noah on his mountain bike, it sounds like it will be family cycling next or you are going to be running! Isla did so well, that is a long way on a little bike, I’m sure Monkey was very encouraging! Kids learning how to ride a bike is such a special time, isn’t it? We’d love to go cycling more often as a family but we still haven’t found a good solution for carrying 6 bikes on our big 7-seater. Lovely photos too, especially the top one.